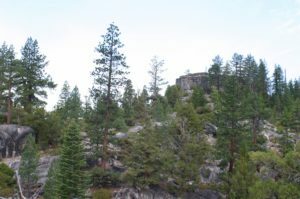 Through my many adventures in our Sierra Mountains, one of my exciting day hikes was following the San Joaquin River west from Mono Hot Springs to Mono Crossing. Centuries ago Mono Crossing was the main route our local Indian Tribes used to forge into the surrounding mountains to escape the San Joaquin Valley heat. Personally I have used this crossing many times following their trail. This will be my first adventure following down-stream to this historic crossing. For two days I asked for a companion to join me on this day’s adventure and without success. Once again I’ll be attempting another solo adventure through an uncharted area. 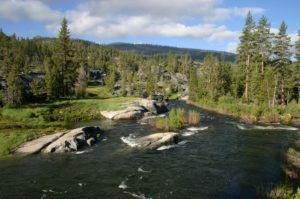 Once I departed from Mono Hot Springs following the San Joaquin River west, I’ll be looking for an area to bolder hop or a downed tree to cross to the opposite side. The cliffs are much too steep on the north bank so the south bank is my objective. Nature was on my side this morning, at a narrow stretch of the river a huge pine tree had fallen the previous winter and extended across for a natural bridge. Years ago I was told by a seasoned hiker; Tom Addison who was in his 80’s. He stated; if I ever attempted this adventure, stay high above the river. Do not attempt to follow the river bank. Following his advice I proceeded following the river climbing in elevation. Forty five minutes later I looked down and standing at the river bank was a lone figure with a fishing pole in hand. We exchanged greetings and he stated the trout were biting early that morning but no luck within the last hour. He and his dog were the only individuals I spoke with that day. As the morning pasted I realized I would have to climb higher to avoid the steep tapering rock walls lining the river banks. At this point I was over 75 feet above the river and the area was becoming much steeper. Then to my surprise a noticed slide marks descending from above me and following to the river edge. As I approached this area I could see a bear found a route down to the water. His identifying tracks were left from his struggle climbing back to flat ground. I followed his day old tracks until reaching the next canyon and once again I started forging my own route. Nature sometimes gives us cherished memories even with today’s hot 90 degree adventure. Above me were two Red Tailed Hawks souring on the thermals created by the rising temperatures from the river. Also off in the distance below my location, riding those same thermals were five separate hawks. I hesitated from my climb just to watch these birds of prey souring below me in long lazy circles looking for their morning meal. After some slipping and sliding following game tracks such as deer, bear and coyote, who also attempted this steep slope, I heard a different screech from overhead by another bird of prey. 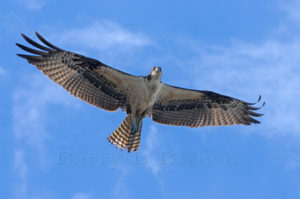 Only 30 feet above me was an adult Osprey circling and descending closer to my location. While adjusting his flight with the thermals he would spread his tail feathers and I could see the dark outline of his distinguished markings against his lighter colored body. This encounter lasted almost a full minute before he lost interest in me and continued searching for food along the river. Around 2:00 o’clock that afternoon I arrived at Mono Crossing. The only sign of human activity was footprints from two hikers earlier that morning crossing the San Joaquin River. I took a half hour break for lunch before starting my hike back up river to Mono Hot Springs. Before arriving at Mono Crossing I noticed below me a flat area but I was much too high in elevation to inspect this possible American Indian Camping area. My guess was correct, along the river were a few grinding holes. This proves that our American Indians were here centuries before the Russians, Spanish and Europeans arriver here in California. Now to depart from this cool area, fill up my extra water bottles for this hot assent to establish a higher route back to Mono Hot Springs. Once again I followed game tracks of deer, bear and coyote. As I came closer to the summit another set of tacks appeared. A Mountain Lion now joined the mix. Needless to say I kept looking over my shoulder while following this pathway to the summit. From this elevation I could clearly see Devils Table (large flat mesa), Devils Bathtub (against the distant mountain range to the north). Mary’s Mountain (east of Mono Hot Springs) and to the west I could follow the San Joaquin River as it flows toward the Minaret Mountains over 40 miles in the distance. The next two miles I’ll be descending back to the San Joaquin River. I’ll have to cross Bacillo and Creek #62 which are tributaries to the San Joaquin River. Then my finial balancing act on that fallen tree which leads to my base camp at Mono Hot Springs. I arrived at base camp before 6:00 o’clock that evening, tired but with a few new stories to share. If you attempt this hike, take someone that is familiar with the area. This is not an adventure for the beginner; cross-country trekking can sometimes become confusing.